Spartan Training Gear is pleased to announce its corporate alliance with Tony Torres, his Functional Edge System and Functional Edge Mixed Martial Arts. The work Tony Torres is doing to advance the development of behaviorally-based personal defense is second to none. We’re pleased that the Hoplite Training Armour can be incorporated into this training and eventually become an indispensable tool to all students of the Functional Edge System. System: An interacting group of items forming a unified whole. An organized and established procedure. The Functional Edge System is a method of studying violent conflicts and learning the skills necessary to efficiently deal with them. The training methods are designed to connect to the necessary attitudes, emotions, instincts, and physical skills and behaviors which will enable and empower the trainees in dangerous situations. We train by cognitively modeling instinctive protective behavior in order to facilitate the physical, psychological and emotional transitions from reactive to responsive. The goal of the Functional Edge System is to merge instinctive behavior with cognitive attitude. Before the Hoplite Training Armour™ was officially launched, we had the prototypes tested by some of the very best trainers in the world. One of the first trainers we contacted was Tony Torres of Functional Edge MMA. He agreed to put it to the test, then sent us this testimonial. “In my experience as a police officer, soldier and as a trainer for Law Enforcement, Military Units, and Civilian athletes, I have had the opportunity to train in just about every training gear out there. 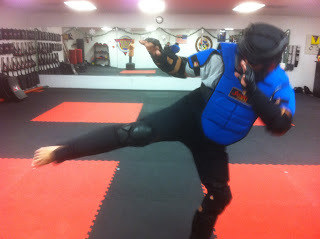 Hoplite Training Armour by Spartan Training Gear is the best by far. It is the perfect combination of protection and mobility. 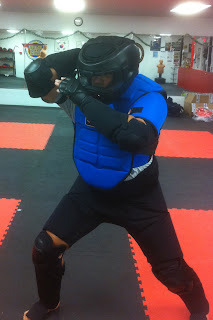 I have used it for self protection scenario training as well as for sparring and even stick fighting. Not only is the protection and mobility the best but also the comfort while wearing it. Keep an eye out for more from Spartan Training Gear™ and the Functional Edge System coming in 2011.